members of DP&S met with a small group of faculty from across campus to discuss the future and scope of digital scholarship at Bucknell. The Digital Scholarship Faculty Fellows worked to develop an approach to digital scholarship that will be valuable and relevant to faculty in all fields. As part of the program, the Fellows completed readings relevant to digital scholarship, discussing their strengths and weaknesses from various disciplinary perspectives. A key concern which emerged from these discussions is the role of digital scholarship in the context of tenure and promotion processes. In Fall 2018 the Fellows plan to host a meeting for faculty from all colleges to discuss their ideas about incorporating digital work into departmental T&P practices. More information on the 2017-2018 Digital Scholarship Faculty Fellows is available here. 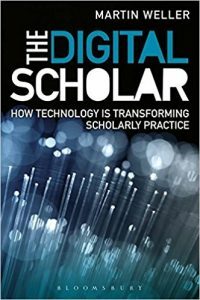 Martin Weller, "The Digital Scholar." Bloomsbury Academic, 2011. 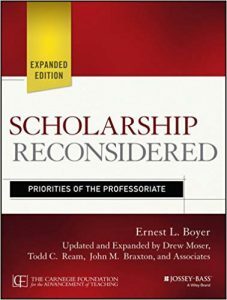 Ernest Boyer, "Scholarship Reconsidered: Priorities of the Professoriate." Jossey-Bass, 2016 .